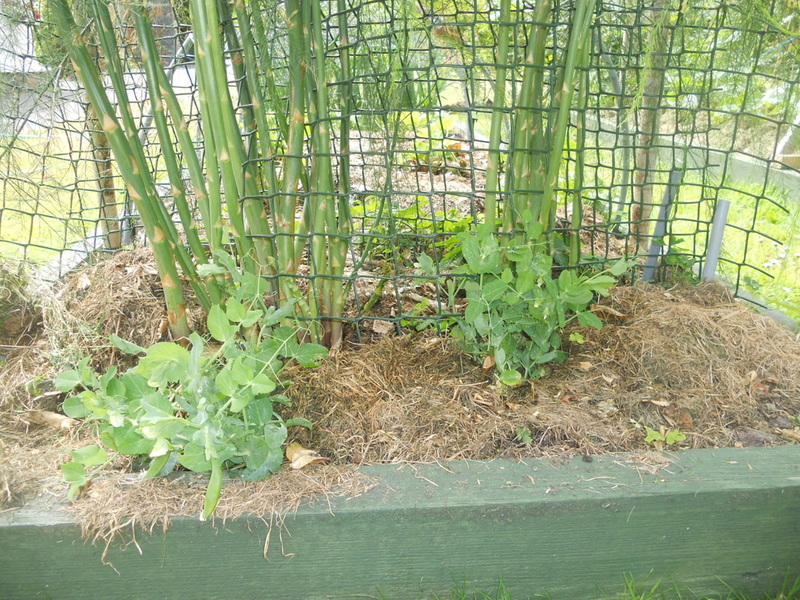 A few years ago I heard a radio gardener say she used grass cuttings as a mulch all over the garden. So I tried it. Big success. 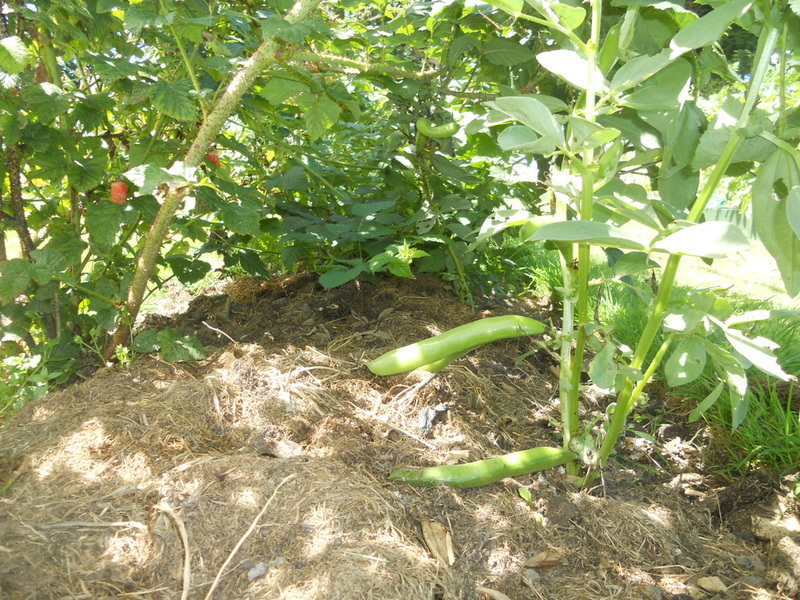 Between the beans and peas, all round the asparagus, in amongst the brassicas, down the raspberry bed, over the spuds. Here's the thing - it not only keeps weeds down and keeps moisture in, but it also feeds nitrogen back to the soil as it decomposes. And what a great way of getting rid of all that grass - the compost heap can only take so much before giving you a hot pile of slime. 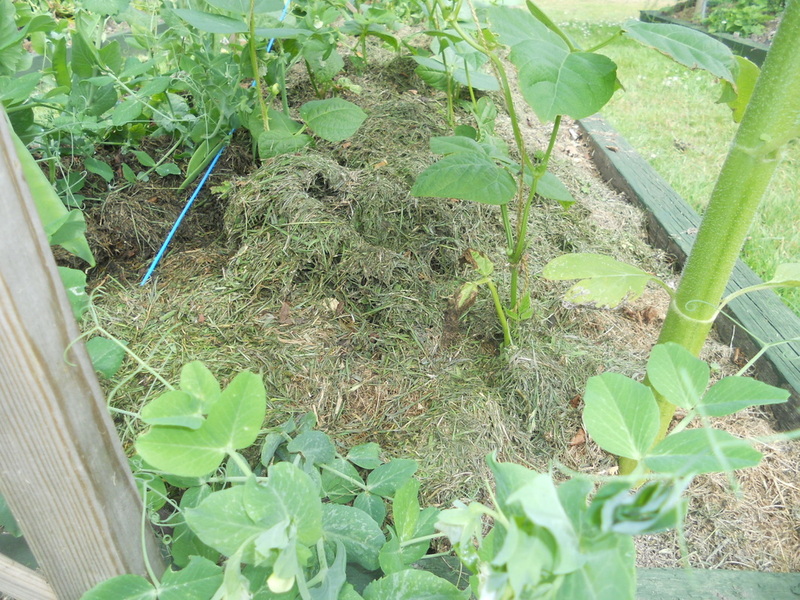 Good thing - when weeds manage to grow, most of the weed is in the grass layer so pulls out really easily. Bad thing - make the grass layer too thick and the rain can't get through as easily, like on a thatched roof. Upshot? Definitely do it, but don't get carried away. What do you think? Join us on our Facebook page and share your own tips. While you're thinking on things veg, have a look at Cindy Lawson's terrific veg site here. When to sow your veg. Click here for a handy year-chart showing sowing. Vraic. It's all around us. It's natural. It's organic. And it's free. 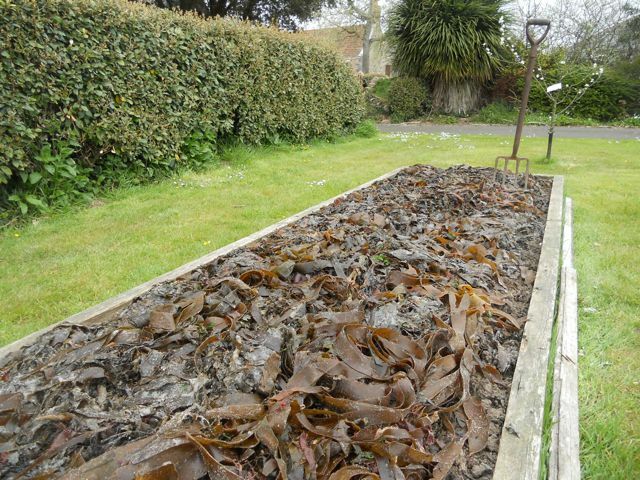 Do you use seaweed on your veg plot? Brown seaweed delivered fresh to our shores every day is an untapped source of goodness for our gardens. Some spend an awful lot of money spreading manufactured chemicals on their vegetable plots - why not take a trip to the beach instead, with some sacks and a fork, and bring back one of the most natural sources of fertiliser there is? Seaweed isn't made of cellulose, so it breaks down quickly and easily, releasing a broad and balanced variety of nutrients and hormones that can be readily absorbed by plants. It also promotes the development of beneficial microbes in the soil, which increases the availabilty to your plants of the soil's nutrients, and it has been found that seaweed plays an important role in raising resistance to bacterial and fungal diseases and detering soil-based pests. Use it at any time of year, either directly on your vegetabe plot, as a mulch around your roses, or add it to your compost heap. Seaweed has so much going for it: it preserves moisture in the soil and so reduces watering; as a mulch it deters weeds and doesn't have the disadvantage of being full of weed seeds; and it is very good for improving the texture and structure of your soil. If you're using it directly on top of your soil, spread it straight away as it starts to break down quickly - it will get pretty sludgy if you leave it in the sacks too long. 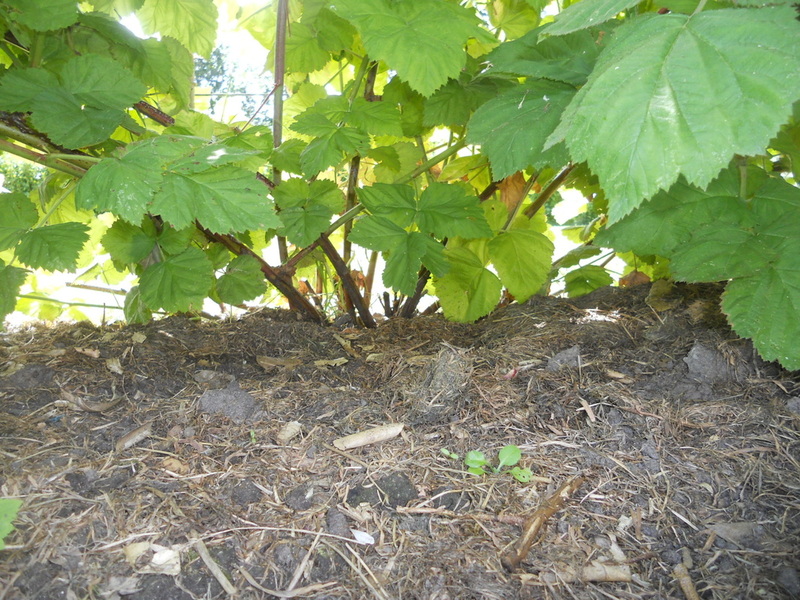 Lay it down a few inches deep and it will dry within days to become crispy, which puts off slugs and snails. You can put another layer down when the first is dry if you want to maintain full cover. You therefore get quick fertilisation from the early breakdown of some of the weed, and slow-release from the dried weed that takes longer to decompse - what more could you want? What about the sand and the salt? Some will say you should spread the seaweed out and rinse it with a hose or allow the rain to wash it out, but this isn't necessary - you will also be washing away some of the benefits. Unless you happen to have a particularly high sodium content in your soil already, the salt won't affect your plants. You may also hear that it will deter earthworms, but experience shows this is not the case. Seaweed has lower levels of nitrogen, potassium and potash than the manure from the farm, so it won't 'burn' your plants when used directly, but it does have a very good array of minerals and trace elements, and is excellent at aiding the up-take of nutrients by your plants. What are you waiting for? This is a plant disease that is currently not affecting Guernsey, but is hosted by certain fruit trees and woody shrubs, such as apple, pear, quince, hawthorn and rowan. The importation of susceptible plants is restricted and the island is designated a 'Fireblight Protected Zone'. If you obtain your plants from local nurseries, there is no need to worry, but if you are bringing in plants by mail order or by importing them yourself, you need to take care not to breach the restrictions - the plants must come from a nursery that is authorised to supply Fireblight Protected Zones. Check the Commerce and Employment March 2013 press release on Fireblight here and their advice leaflet here. If you have any queries, contact the Plant Health Inspector at C&E on 234567. The States Public Services Department is currently looking into the benefits of introducing a food waste composting facility, and is keen to hear from interested parties. The department hopes to provide a plant in 2015 to deal with this organic waste, and is gathering views on how the compost produced by the facility can best be used. If you have any queries, you can contact Rob Roussel at PSD on 234686 or at rob.roussel@gov.gg. 24 July 2012, a fine evening with a good turnout, from some interested youngsters to Gracious Gran bringing up the rear - in all 30 members and friends of Guernsey Smallholders including your Roving Reporter. Gary Le Poidevin, Head Gardener at Government House, showed us around the grounds giving us the benefit of his 29 years’ experience working in the gardens. He explained that the fields surrounding the house, now laid out to lawns, had been used for many years as agricultural land, with cattle grazing the fields right up until the 1980s. The area is now used for community functions such as garden parties and the Queen’s Birthday celebrations, as well as two of the Town schools using the grass for their school sports days. The Police have even been allowed to test some explosives in the private open space, although Gary wasn’t keen on allowing too many holes to be blown in the lawns! Have you been growing your own for a while? Do you have half a dozen things you learned the hard way? Did an old gardener pass on some gems to you? We need an article on this site that will help new fruit and veg growers in their early days. Why not send us an email at gsysmallholders@cwgsy.net with some of your tried and tested tips to get things going, and we'll do the rest. Or, if you fancy, write a short (or long) piece yourself and we'll post it here. We'd also love to use photos of your veg patch or orchard, even if you don't compose an article, so please feel free to send them in.